Wouldn't you like to have a cute little thread catcher near your machine for thread ends and even fabric scraps; try making one. This is a guide about making a thread catcher. I've decided I need a thread catcher for my sewing machine, but mine needs to be a little different. I have some scraps of a pretty pastel double sided quilted fabric that I'd like to use (getting serious about stash busting these days). I want one with a tab so I could attach it to the drawer handle of my sewing machine cabinet. How could you stiffen the top so it would stay open? One way to stiffen the top of the container is to insert something stiff into the top hem. Some things you could use are a wire coat hanger, a strip of plastic cut from a gallon vinegar or bleach container, plastic "stays" from an old bustier, the top rim of a large margarine or yogurt container. My personal preference for dumping thread etc. while I am sewing is to put a small waste basket on each side of my chair on the floor. That way I can throw out things on either side without turning. I used some strapping off of some shipping stuff that my son got me, it gets thrown away at most large stores just ask them for a piece. 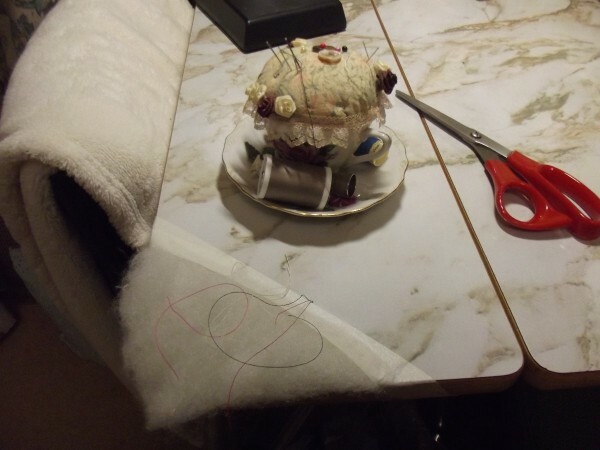 I tape a piece of quilt batting or poly stuffing to a corner of my sewing table. Thread sticks to it and it's not hard to clean off at the end of the day.